We had a great run with SPAMALOT and we hope you enjoyed the show! VENUE: the well equipped Performing Arts Center at Taconic Hills Central School District in nearby Craryville NY. DATES: Oct. 11th, 12th, 13th, 2013, and a second weekend on Oct 18th, 19th, and 20th, 2013. TIMES: Fridays and Saturdays at 7:30pm, Sunday matinees at 3pm. Killer rabbits, not quite dead peasants, overly brave knights, a sword rising from a lake, what kind of story is this? While CAMELOT told the classic tale of King Arthur and his Knights of the Round Table, the smash Broadway musical SPAMALOT presents a hilarious and irreverent take on this beloved story. Loving ripped off from the classic film comedy Monty Python and the Holy Grail, SPAMALOT retells the legend of King Arthur and his Knights of the Round Table, and features a bevy of beautiful show girls, not to mention cows, killer rabbits, and French people with outrageous accents. The Two Of Us Productions, based in Columbia County NY, is proud to present this wildly funny, award winning new musical. SPAMALOT, with book and lyrics by Monty Python’s Eric Idle & music by John Du Prez and Eric Idle, brings to the stage the many beloved scenes and characters that made the Holy Grail movie such a memorable hit. SPAMALOT is being presented by The Two Of Us Productions from October 11th to 20th in the beautiful Performing Arts Center (PAC) at Taconic Hills Schools in nearby Craryville NY. The Two of Us Productions is well known throughout the Hudson Valley for presenting quality theater, both musicals and dramas. One of their trademarks is presenting musicals with full orchestras, a rarity that is a great treat for their audiences. They have performed at a variety of venues throughout the area including: Chicago at the BCC Boland Theater in Pittsfield, MA; Arthur Miller’s Broken Glass at the Valatie Community Theatre in Valatie, NY; The Owl and the Pussycat at the Cuneen-Hackett Theater in Poughkeepsie, NY; Cabaret and Christopher Durang’s Beyond Therapy at Stageworks/Hudson; John Pielmeier’s Agnes of God at The Lichtenstein Center for the Arts in Pittsfield, MA; They’re Playing Our Song at Rhinebeck Performing Arts Center; and most recently Jesus Christ Superstar, Ragtime, The Musical and the NE regional premieres of Next to Normal and Tale of Two Cities, The Musical in Hudson, NY. Eric Idle, one of the Monty Python founders, authored this musical, penning the script as well as the lyrics, giving SPAMALOT the biting irreverence and classic silliness we’ve come to expect from the Monty Python troupe. The pace of this show is brisk, the music and lyrics are hilarious, the characters are outrageous, all the elements for a wildly funny musical comedy that you don’t want to miss. 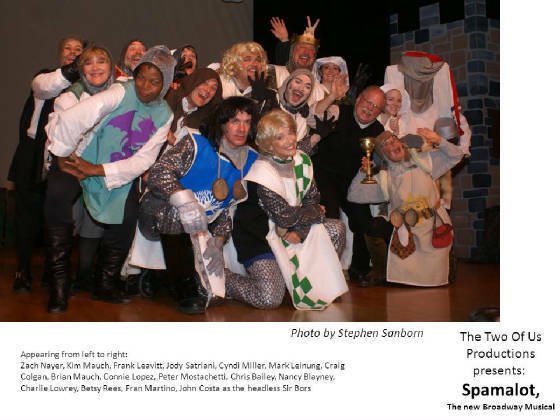 Monty Python’s SPAMALOT is being presented at the Performing Arts Center at Taconic Central Schools in Craryville NY. Performances are 2 weekends only, October 11th, 12th, and 13th, and the following weekend of October 18th, 19th, and 20th, 2012. Friday and Saturday performances are at 7:30pm and Sunday matinees are at 3pm. Tickets are $18 for adults, $14 for students & seniors, and $12 for groups & families. For tickets visit www.TheTwoOfUsProductions.org or call 1-866-811-4111 or 518-758-1648. For directions and parking please visit www.TheTwoOfUsProductions.org and click on the page for SPAMALOT. Make your reservations early for the best seats!